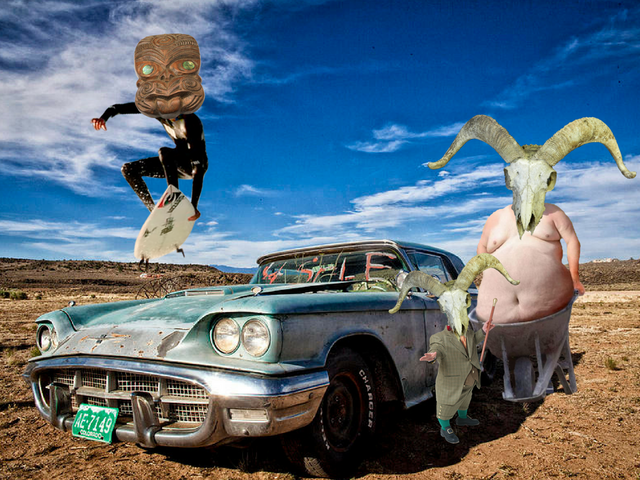 When you find yourself in the desert, it can be difficult to surf. Especially when a scorpion pinches your toe and yells "Schnar Snar!". For week 4, a lament for when we cannot be by the beach or by our guitar. To all the waves not ridden and to all the reverb under-used. Great tune and the mix is sounding good. Love the finale. Morricone for all. Great! Last part is amazing! I don't know what that image is, but it fits perfectly. "I'm here for the excellent surf riffs!" Love that ending as well. Your tracks are fyahhh! Possible to find out any information about your recording setup/process? Thank you for listening. All of these track are produced in Ableton Suite. I record the guitar and bass direct through a very crappy but reliable zoom interface and process the guitars with NI Guitar Rig 5. The drums are NI Studio Drummer mostly which I program with a Keith McMillan QuNeo. I would love to record amps instead but time and space do not permit. [quote=K-o-m-o-d-O]Love this! Possible to find out any information about your recording setup/process? Lots of vibe + swagger[/quote] Thank you for listening. All of these track are produced in Ableton Suite. I record the guitar and bass direct through a very crappy but reliable zoom interface and process the guitars with NI Guitar Rig 5. The drums are NI Studio Drummer mostly which I program with a Keith McMillan QuNeo. I would love to record amps instead but time and space do not permit. very professional sounding production, good job!